In the fall of 2002, after five years of politics and planning, Tacoma Narrows Constructors started on the New Tacoma Narrows Bridge. This 5,400 foot long suspension bridge, $849 million, was a joint venture between Bechtel and Kiewit. Seven years later, the first passenger vehicles drove across in July 2007. 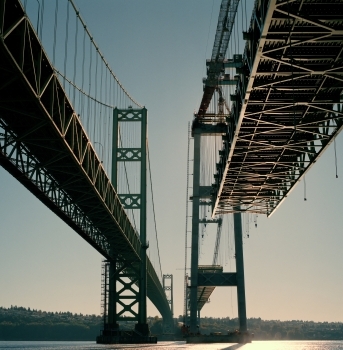 This massive structure stands parallel to the original Tacoma Narrows Bridge. The goal of the new bridge was to provide safer crossing and reduce congestion for people traveling in the Puget Sound area. 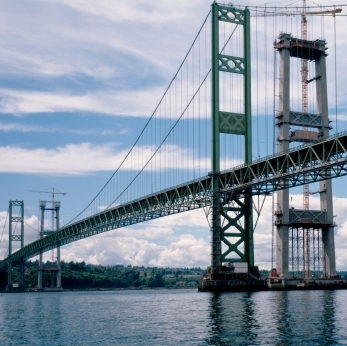 This massive bridge contains 35.5 million pounds of structural steel and numerous bolted connections. Over a three year period Portland Bolt was asked to supply a variety of construction fasteners. Products manufactured for the this job included bolts for the saddle supports, main span bolts that included 2-1/4″ ASTM A449 anchor rods, and large 1-1/2″ diameter A325 heavy hex structural bolts delivered in one day.